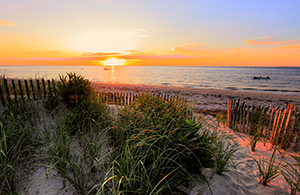 Cape Cod is home to a variety of beautiful beaches from private, small havens to popular, public spots. Below is a list of Cape Cod beaches including those with Summer lifeguards, restrooms, are pet-friendly, and more. Some beaches have snack bars, and virtually all are included in the routes of local ice cream trucks, whose bells call children in from the water faster than you can say Creamsicle. So pack up your picnic basket (leave the glass at home), grab some sunscreen, put on your shades, and come along! Parking is a big consideration when planning a day at the beach. Many beach lots fill quickly on summer days. Nauset Light Beach in Eastham, for instance, is often full by about 10 AM in July and August. Some do charge admission or require a parking sticker, which is generally available at town halls or certain beaches. Requirements differ from town to town and, within towns, from beach to beach. A note of caution: if you park illegally, you will be ticketed and fined. Sometimes public transportation is an option. Hyannis, for instance, offers a beach trolley. Or you can ride a bike! Admission to most beaches is free for those who walk or bike in. Also keep in mind that the rates printed here are subject to change depending on the time of year. Some town beaches are designated for residents only. This means the beach is town-owned and supposed to be reserved for the use of resident taxpayers. In most cases, this designation is made because these beaches are small and have very limited parking. Generally, "resident only" means you must have a resident/taxpayer sticker on your car to park in these areas, but there's nothing to stop you from walking or biking there. Please don't try to park at these beaches without a resident sticker. You will be ticketed and in some cases towed! Yes, there is such a thing. This issue has been and will continue to be debated, particularly in reference to shell-fishing rights. Unlike most other states, waterfront property owners in Massachusetts may own the beach in front of their home to mean low tide - an imaginary line between high tide and low tide. This line obviously varies on various conditions. The phrase "mean low tide" and it's impossible to generalize with any certainty how close you should hug the waterline when passing in front of private property. The law reads that access across beaches is allowed for "fishing, boating, and waterfowling," so you might want to carry a fishing pole just in case. Many of the public beaches are alongside private beaches. As inviting as a nearly empty beach may be, the public does not have the right to post up on a private beach. These beaches are usually marked with a small "no trespassing" or "private property" signs. Most waterfront property owners understand the lure of the beach and, if you pass with respect, won't get upset if people walk along. Some of the Cape's best walks are across miles of bay beach, both public and private. Cape Cod beaches have a dog ban between April 1st and October 1st. Regardless if they are on a leash or obedient, taking a dog on the beach during this time is punishable by a fine of up to $50. Some beaches, like Nauset Beach in Orleans and Craigville in Centerville, will not allow you to enter the park if a dog is in your vehicle. At the smaller beaches, signs are posted at the entrance path to the beach area. During the off-season when crowds have gone, the rules are more relaxed. Dogs should be under control at all time. Besides other people, there are also nesting birds or stranded seals. The Endangered Species Act provides penalties for taking, harassing, or harming the piping plover, for example, and we take the law seriously here. If your dog disturbs a plover's nest or otherwise disturbs one of the protected species, someone will be waiting for you in the parking lot upon your return. Most trails and beaches offer some sort of doggie "dispoza-scoop" to help pick up after your dog. 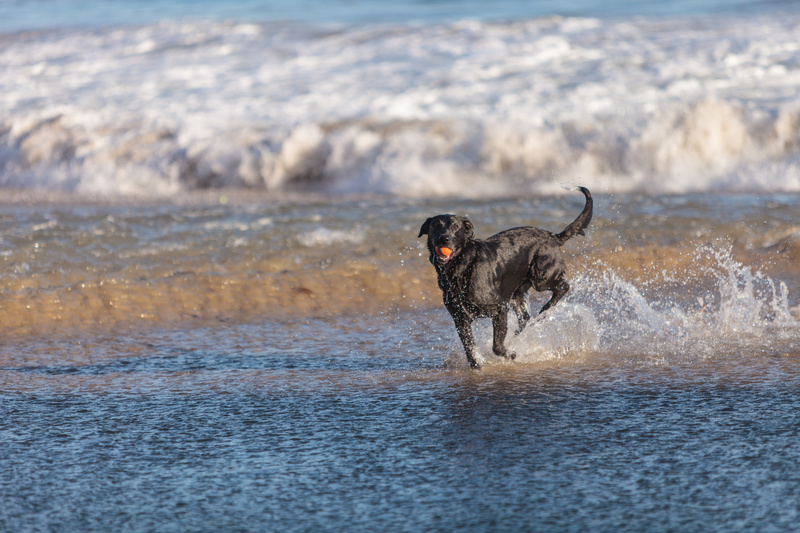 Not picking up after your dog is a form of pollution that contaminates shellfishing beds and wetlands. Upper Cape towns have coastlines along the waters of Cape Cod Bay, Buzzards Bay, Vineyard Sound, Nantucket Sound, and the Cape Cod Canal. These southern waters are generally calm and warm with water temperatures reaching 70s during the summer. The bay beaches in Sandwich are influenced by a different tidal system and are colder. Another influence is the Cape Cod Canal, a structure that has interrupted the natural sweep of wind-carried sands along the curve of the shore. As a result, Sandwich beaches tend to be rockier than others but are distinctly charming. Bourne is home to a number of fine saltwater beaches stretching across its more than 50 miles of coastline along Buzzards Bay. It also has about 2 miles of frontage on Cape Cod Bay to the north as well as a couple of ponds available for freshwater swimming. Like many Cape towns, Bourne holds a tight guard on parking at its beaches. The only beach with public parking is Monument Beach. The state-owned Scusset Beach on the Bourne-Sandwich line has $2/day parking. To park at any other beach in Bourne you need a resident sticker, or prove you're staying at a Bourne campground or rental property. Beach parking stickers are required if you want to park at a town beach and can be picked up for $20 at the Natural Resources Office, Bourne Town Hall, 24 Perry Avenue, Buzzards Bay, (508) 759-0623. Bourne does not have a daily parking fee. Electric Avenue Beach is on Buzzards Bay at the entrance to Buttermilk Bay near the Buzzards Bay rotary. Lifeguards are on duty at this beach. Monument Beach is along Shore Road and Emmons Road and has public parking. It looks out on the Bourne entrance to the Cape Cod Canal and the Monument Beach Marina. Lifeguards are on duty and there's a concession stand and bathhouse on site. Gray Gables Beach is in the village of Gray Gables. President Grover Cleveland spent his summer vacations here when he was President. It has lifeguards and toilets, but no concessions. 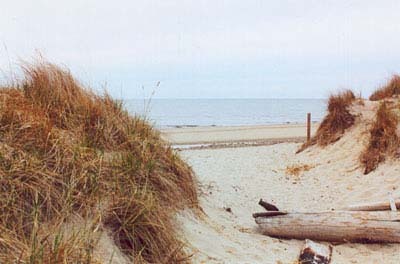 Scusset Beach is a popular beach on the north side of Cape Cod Bay. It is a large, clean, state-fun beach predominantly in the town of Sandwich. Parking is $2/day or $15 for a season pass. This beach has a snack bar and a bathhouse available. Sagamore Beach, at the Sagamore Highlands, is really three interconnected beaches on the mainland side of the Cape Cod Canal. Though there are no concession stands, lifeguards are on duty and toilets available. Barlows Landing Beach is off of Barlows Landing Road in Pocasset. Overlooking beautiful Pocasset Harbor, this beach has lifeguards and toilets but no concession stands. Hen Cove Beach, also known as Pocasset Town Beach, is on Hen Cove in Pocasset which empties into Red Brook Harbor. The beach is protected by both the cove and harbor, making it a nice place for the kids. There are lifeguards on duty and toilets but no concession stands. Squeteague Beach is a well-protected beach on Cataumet's Squeteague Harbor. There are no lifeguards or concessions at this beach. There is one toilet. Queen Sewell Pond is in Buzzards Bay and has fresh water swimming. There are lifeguards and toilets at this beach. Picture Lake is another fresh water pond located off of Williams Avenue. This beach has lifeguards but no bathroom facilities. Sandwich has saltwater access along the north shore that borders Cape Cod Bay. A portion of this shore lies on the other side of the Canal (the mainland side). Although deprived of the large harbors, coves, and bays present in many other Cape towns, Sandwich has a number of freshwater ponds in the south, including Peters Pond and Snake Pond. It also has frontage on a portion of Mashpee's Wakeby Pond, just enough to sneak in a beach. You need a sticker to park at all beaches in Sandwich. Residents pay $15 and nonresidents pay $20. A sticker will not get you in the resident-only Snake Pond area.. All stickers are sold at the Sandwich Town Hall, (508) 888-4910. One-day parking passes are also available at the beaches for $4. Town Neck Beach is at the end of Town Neck Road. There are no lifeguards on duty, there are restrooms and a concession stand. Town Beach rests at the entrance to Sandwich Harbor. Nearby is the famous Sandwich boardwalk crossing Mill Creek. It offers concession stands and bathroom facilities but no lifeguards. East Sandwich Beach, also known as Springhill Beach, is a permit parking only. It has no lifeguards, concession stands or toilet facilities. Sandy Neck Beach is a beautiful beach with high sand dunes that stretches for miles along Cape Cod Bay. It lies in both Sandwich and Barnstable. It has lifeguards, concession stands and bathroom facilities. Many people enjoy taking a four-wheel-drive vehicle onto Sandy Neck Beach for a day of fishing and swimming; this requires buying a permit through the Town of Barnstable. Falmouth offers more miles of coastline than any other Cape town. This coastline is blessed with many fine harbors as well as a number of wonderful beaches. The southern shoreline borders Vineyard Sound while the western side overlooks Buzzards Bay. If you plan to park at any but three of these beaches, you need a sticker, given only to residents or guests who can show they are staying in Falmouth. Stickers are available at the Surf Drive bathhouse. Guest stickers cost $125 for the summer, $50 for one week, $55 for two weeks, $65 for three weeks and $75 for four weeks. Residents pay $20 for a two-year beach parking sticker. Three beaches--Surf Drive, Old Silver, and Menauhant--have daily passes available for anyone. For more information about Falmouth beaches, call the Falmouth Beach Committee at (508) 548-8623. Along Vineyard Sound, Surf Drive Beach is the closest beach to Falmouth village center. This beach offers lifeguards, a bathhouse with showers, and a concession stand. The waters here are warm and calm with wonderful views of Martha's Vineyard across the sound and Nobska Light nearby. A small inlet to the north of the beach is popular with families who have little kids. Surf Drive is one of the three beaches in town where you can park without a sticker for $10 a day. Old Silver Beach in North Falmouth is as popular as it is beautiful. The Buzzards Bay waters here are warm and ideal for youngsters. A creek splits the beach in two; one side is for residents and the other side for visitors to the town. Lifeguards watch over the swimmers and a concession stand keeps hunger at bay. Portable toilets and showers are available. You don't need a sticker to park here, but you do need to buy a $10 pass. Another North Falmouth beach is Megansett Beach on Buzzards Bay. Like Old Silver Beach, the waters here are warm. The beach has lifeguards but no concession stands or bathhouses. Parking is by resident sticker only. Chapoquoit Beach rests along Buzzards Bay just south of West Falmouth Harbor off Chapoquoit Road. This residents-only beach has lifeguards, concessions and toilet facilities in the form of portable toilets. Wood Neck Beach can be found at the mouth of the saltwater Little Sippewissett Lake in West Falmouth. Its waters are warmed by Buzzards Bay. Wood Neck has concessions and portable toilets on site as well as lifeguards. Parking is by sticker only. Falmouth Heights Beach overlooks Vineyard Sound and Martha's Vineyard and the waters are warm and inviting. There are lifeguards on duty and portable toilets available, and though there are no concession stands, there are a number of places nearby to get something to eat. Two other wonderful Vineyard Sound beaches are Menauhant and Bristol. Both south side beaches have lifeguards, concession stands and portable toilets. Menauhant also has showers. Bristol Beach is accessible by sticker only. There is a $10-per-day parking fee at Menauhant for those without a sticker. Grews Pond is a wonderful little freshwater pond in Goodwill Park off Gifford Street just north of Falmouth center. The pond has lifeguards on duty, and toilet facilities are available. There is no charge for public parking. The southernmost portion of Mashpee touches Nantucket Sound, Waquoit Bay, and Popponesset Bay. Within the town are a number of large ponds: Ashumet and John's Ponds in the west, Santuit Pond in the east, and the connected Mashpee and Wakeby Ponds along the northern border with Sandwich. Parking at all but one beach requires a Mashpee resident sticker obtained at the town hall on Great Neck Road; call the Mashpee Town Offices at (508) 539-1446 for more information. If you're not a resident, or more appropriately, do not have a resident parking sticker, South Cape Beach at the southern tip of Mashpee is run by the state and allows anyone to park for a fee. South Cape Beach on Nantucket Sound is a great, unspoiled place to enjoy sand, sea, and sun. About 3½ miles from the Mashpee Rotary at the end of Great Neck Road South, the beach is operated by both the town, which has a parking lot and requires a resident sticker, and by the state Department of Environmental Management, which has a large public parking lot and charges nonresidents of Mashpee a fee per day. Lifeguards are on duty, and toilet facilities are available. For freshwater swimming, go to Attaquin Park on the 700-plus-acre Mashpee-Wakeby Pond, the Cape's largest freshwater body. The park, off Mass. Rt. 130 at the southern end of the pond, has a swimming area, lifeguards, toilet facilities, and a state boat ramp with parking available. Another popular freshwater spot is John's Pond at Hooppole Road off Mass. Rt. 151 and Currier Road. It has a public beach complete with lifeguards, a volleyball net, and toilet facilities. The beaches of the Mid-Cape can be found on two separate bodies of salt water--Nantucket Sound to the south and Cape Cod Bay to the north. These have the Cape's warmest waters. Nantucket Sound is fed by warm southern waters, and its relatively shallow depth of about 40 feet, sandbars that stretch as far as Nantucket, allows it to hold its warmth. On the bay side, the tidal flats of the Mid-Cape heat up the north-side waters as they ebb and flow over the sand, which has been baking in the sun. The best time to swim in these waters in when high tide occurs late in the day and the sun has all day to warm the sands. On the whole, beaches in this long middle area of the peninsula are not as affected by currents and rips as the Lower Cape. There are also a number of beautiful lakes and ponds offering freshwater options. Cotuit has three fine beaches, all requiring resident stickers to park. Oregon Beach off Main Street has no lifeguards or restroom facilities, nor does Ropes Beach, located in the protected Cotuit Bay. Cotuit's Loop Beach, also off Main Street, does have lifeguards and bathroom facilities. Neighboring Osterville has a fine saltwater residents-only beach on Vineyard Sound at the end of Wianno Avenue called Dowses Beach. Lifeguards oversee Dowses Beach and toilet facilities and concessions are available. The often-crowded Craigville Beach off Craigville Beach Road in Centerville is a favorite with sunbathers and swimmers. On Nantucket Sound, this beach has a large parking lot and a bathhouse with outdoor showers. There are lifeguards on duty. Two nearby residents-only parking beaches in Centerville are Covells Beach along Craigville Beach Road to the east of Craigville Beach and Long Beach on Long Beach Road to the west. Covells has lifeguards and restrooms; Long Beach has neither. Hyannis has four beaches--East Beach, Kalmus Beach, Sea Street Beach, and Veterans Beach. East Beach, just west of Hyannis Harbor, has residents-only parking with no food or bathroom facilities and no lifeguards on duty. As a windsurfing beach, Kalmus Beach at the end of Ocean Street in Hyannis is considered by some to be the best on the Cape. One of two beaches in Hyannis Harbor, Kalmus has a windsurfing area, snack bar, bathroom facilities, and a picnic area; and the beach is protected by lifeguards. Sea Street Beach at the end of Sea Street is the second public beach in Hyannis Harbor and is within walking distance of many accommodations in Hyannis. This beach has a bathhouse, snack bar, and picnic area; lifeguards are on duty in season. With a delightful view of Lewis Bay, Veterans Beach on Ocean Street in Hyannis is a popular place where families enjoy picnics and cookouts shaded by a pine grove. The facilities include a bathhouse, snack bar, picnic area and playground, and lifeguards. The Kennedy Memorial is adjacent to Veterans Beach. Six-mile-long Sandy Neck Beach, north of Mass. Rt. 6A in West Barnstable, is the town's longest beach. The road that leads to the beach, Sandy Neck Road, actually connects with Mass. Rt. 6A just over the town line in East Sandwich. Sandy Neck Road then works its way north into West Barnstable before reaching the beach parking lot. This beach offers swimming, fishing, camping and hiking. Facilities include indoor restrooms, showers, and a snack bar; lifeguards work this beach. Next to picturesque Barnstable Harbor at the end of Millway along the north shore of the town is Millway Beach. This beach offers a great view of the boat traffic entering and leaving the harbor, but parking is for residents only. Millway Beach has lifeguards and restroom facilities. Across the waters is Sandy Neck with its decommissioned lighthouse at the point. For freshwater swimming, there is the residents-only Hamblin Pond off Mass. Rt. 149 in Marstons Mills with lifeguards, restrooms, and a picnic area. Another Marstons Mills pond is Lovells Pond off Newtown Road, with lifeguards and restrooms. Joshua's Pond on Tower Hill Road in neighboring Osterville has bathroom facilities and a playground for the kids, as well as lifeguards. Lake Wequaquet, also residents-only, on Shoot Flying Hill Road in Centerville, is a freshwater playground. The lake is almost 2 miles long and roughly a mile wide. Bathroom facilities are on site, as are lifeguards. Hathaway's Pond off Phinney's Lane in Barnstable has restrooms and a picnic and playground area. Lifeguards are on duty. Yarmouth has coastlines to the north on Cape Cod Bay and to the south on Nantucket Sound and Lewis Bay. The east side of the town borders Bass River to the south and Garden Creek to the north. The north side of the town on Cape Cod Bay is only about one and a half miles long and is largely marshland, save for a small beach at Bass Hole on the east end. The south side has many fine beaches and all but four require a parking sticker. Sea Gull, Sea View, Parker's River and Bass River beaches all allow daily parking for a $10 fee if you do not have a sticker. Two beaches in Yarmouth--Dennis Pond and South Middle Beach--require a resident parking sticker. Nonresidents can obtain a sticker for $40 a week or $125 a season. Stickers are available at the Town Hall on Mass. Rt. 28. Call the Park Department, (508) 775-7910, from 7 AM to 3:30 PM for more information. Off Sea Gull Road, which is off South Sea Avenue in West Yarmouth, is where you'll find Sea Gull Beach. Offering plenty of parking spaces, this is Yarmouth's largest and most popular beach, especially with high school and college students. Sitting just west of Parkers River, it has lifeguards, toilet facilities, a few picnic tables, and concessions. There is a daily parking fee at Sea Gull Beach is $10. From Bay View Beach, at the end of Bay View Street in West Yarmouth near the town line with Barnstable, you have a good view of Lewis Bay and the thousands of boats that enter Hyannis Inner Harbor every year. Bay View Beach has lifeguards on duty, bathroom facilities, and free parking. Colonial Acres Beach at Lewis Bay is at the end of Standish Way in West Yarmouth has portable toilets and a new bridge out to the beach. Englewood Beach, also in West Yarmouth on Lewis Bay, is at the end of Berry Avenue. Englewood has a small, free parking lot, restroom facilities, and lifeguards. On the east side of the mouth of Parkers River is Sea View Beach off South Shore Road in South Yarmouth. This southside beach is protected by lifeguards, it has a picnic area and portable toilets, and the $10 parking fee is well worth it since it's a lovely beach. To the east of Sea View Beach along the Cape's southern shore is Parkers River Beach, which lies along the warm waters of Nantucket Sound. The beach has restroom facilities, a concession stand, outdoor showers, swings, good parking, and lifeguards. It costs $10 a day to park. South Middle Beach on South Shore Drive in South Yarmouth is a residents-only beach offering a large parking lot and restroom facilities. Lifeguards keep an eye on the activities out on Nantucket Sound. About a half-mile up Bass River is where you'll find Windmill Beach off River Street. It is a small beach with no lifeguards or toilet facilities, but the views of the river are spectacular. Nearby is the Judah Baker windmill built in 1791. Wilbur Park and its beach area are about 4 miles up Bass River where Highbank Road bridge connects South Yarmouth with the village of South Dennis. Though there are no lifeguards or bathroom facilities, Wilbur Park has a picnic area and a boat ramp. The only beach on the north side is Bass Hole, also known as Gray's Beach. It is at the end of Centre Street off Mass. Rt. 6A in Yarmouthport and is considered by many to be one of the great spots on the Cape to watch the sun going down. Bass Hole is at the mouth of Garden Creek and has a long boardwalk that extends over the salt marsh and offers an excellent view of coastal plant and marine life as well as nature's beauty. Across the river is Dennis' Chapin Beach. Bass Hole Beach is rather small and, at low tide, has very little water, which makes it perfect for small children (just pay attention to the tidal current in the creek). Bass Hole Beach has a large picnic area complete with a pavilion and bathroom facilities. You'll also find some free parking, and there are lifeguards on duty. In addition to its wealth of saltwater beaches, Yarmouth also has four public beaches at freshwater ponds. Sandy Pond off Buck Island Road in West Yarmouth offers not only a beach for swimming but also playing fields for softball, basketball and soccer, tennis courts, and a playground. The beach has lifeguards on duty and a comfort station. Long Pond is off Indian Memorial Drive in South Yarmouth. Lifeguards are on duty and portable toilets are available. The beach also has a playground on site and free parking. An Indian burial ground is nearby. Also in South Yarmouth, Flax Pond Recreation Area has picnic areas, tennis and volleyball courts, and softball fields. Toilet facilities are provided and lifeguards are on duty. Dennis Pond off Summer Street in Yarmouthport requires a town beach parking sticker. You'll find lifeguards and toilet facilities at this pretty pond located just a stroll from Yarmouthport village. With fine beaches on both the north and south sides of town, it's no wonder that so many tourists make Dennis their vacation destination. There are eight beaches on Cape Cod Bay and another eight on Nantucket Sound. If you prefer freshwater swimming, Scargo Lake offers two beaches. Residents pay $17 for a each parking permit while non-residents pay $150 for the season. A seasonal pass can be acquired for $115 to those who can produce a rental lease for four or more weeks. Weekly stickers run $34 while daily parking fees cost $10. Stickers can be obtained at the Dennis Town Offices on Main Street in South Dennis at (508) 394-8300. Chapin Beach on Chapin Beach Road at the northwest corner of Dennis is a favorite among owners of four-wheel-drive vehicles. At low tide, those looking for shellfish will delight in being able to walk more than a mile out on the tidal flats of Cape Cod Bay. The beach has no lifeguards and no restrooms, but portable toilets are available. Across the water is Yarmouth's Bass Hole and Gray's Beach. Also on Cape Cod Bay is Mayflower Beach at the end of Beach Street. In addition to restrooms and concessions, this beach features a boardwalk that stretches from the large parking lot over the dunes to the beach below. Mayflower Beach is staffed with lifeguards. Bayview Beach at the end of Bayview Road is a residents-only beach. Though there is a boardwalk leading to the beach, there are no restrooms or concession stands, but lifeguards are on duty. Crescent-shaped Corporation Beach, off Corporation Road and hugging Cape Cod Bay, is a popular spot on hot summer days. The curve of the beach forms a tidal pool that's perfect for children. Corporation Beach has lifeguards, a concession stand, restrooms, showers, and even a swing set for children set on a bluff overlooking the bay. Howes Beach is a small public beach off Howes Street, just east of Corporation Beach. Howes has a boardwalk and lifeguards but no restrooms or concessions. Two East Dennis residents-only beaches are on each side of Sesuit Harbor. On the west side is Harborview Beach, which has no facilities, although a lifeguard is present. Cold Storage Beach on the east side of the harbor has restrooms and lifeguards but no concession stands. The last public beach on the north side is Sea Street Beach at the end of Sea Street in Quivet (East Dennis). There is a boardwalk leading to the beach, as well as lifeguards and portable toilets but no concession stands. There is perhaps no more popular Mid-Cape beach than West Dennis Beach, off Davis Beach Road in West Dennis. Situated on a narrow patch of sand on Nantucket Sound just east of the mouth of Bass River, the beach stretches for more than a mile. Beachgoers begin to arrive here by 10 AM, but since the parking lot has room for more than 1,000 cars, you'll rarely have to worry about finding a space. The eastern end of the beach is reserved for Dennis residents; the western end, however, is less crowded and open to everyone. A well-equipped snack bar concession, restrooms, and showers provide all the comforts while 10 lifeguard stations make this a safe, secure haven. At the beach is the Old Bass River lighthouse. About three-quarters of a mile east of West Dennis Beach is South Village Beach by the mouth of Swan River. South Village has parking for both residents and nonresidents. Toilet facilities and lifeguards are on site, but there are no concession stands. A number of Dennisport beaches are available for the visitors who rent cottages in this south side village. Haigis Beach lies where Ocean Drive meets Old Wharf Road. Lifeguards are on duty and toilet facilities are available. There are no concession stands but there is a small store right across the street from the beach. Further down Old Wharf Road is Glendon Beach opposite Glendon Road. Like Haigis, Glendon has lifeguards and toilet facilities. Again, there are no concession stands although a small store is just a short walk away. Sea Street Beach at the end of Sea Street in Dennisport is perhaps a half-mile east of Glendon Beach. Like Glendon and Haigis, the Nantucket Sound waters here are warm and the beaches are marked with rock jetties. Sea Street Beach has restroom facilities, concessions and lifeguards on duty. The next two beaches do not have lifeguards, restrooms, or concessions, and both have parking by sticker only. Raycroft Beach is at the end of the short Raycroft Parkway off Old Wharf Road. To the east about a couple of hundred yards is Depot Street Beach at the end of (you guessed it) Depot Street. At the end of Inman Street off Chase Avenue is the final saltwater beach in Dennisport. Flanked by motels with private beaches on either side up and down the popular Chase Avenue, Inman is a public beach that offers toilet facilities but no concessions. Lifeguards keep tabs on what's going on out in the water. Scargo Lake is a 50-plus-acre freshwater sandy-bottomed kettle hole--nearly 50 feet deep--nestled at the bottom of Scargo Hill. The lake is home to two popular beaches: Princess Beach, off Scargo Hill Road, and Scargo Beach, off Mass. Rt. 6A. Princess Beach has restrooms and a picnic area as well as lifeguards. Scargo Beach, narrow and tree-lined, also has toilet facilities and a lifeguard. Beaches in this area are on Cape Cod Bay, Nantucket Sound, and the Atlantic, plus numerous freshwater ponds. The Cape Cod National Seashore (CCNS), (508) 349-3785, has great beaches in Eastham, Wellfleet, Truro, and Provincetown. Admission to any CCNS beach from late June to Labor Day is $7 per car; admission is $1 for walkers or bikers. For $20 you can get a season pass good at all CCNS beaches--a wise investment if you'll be staying a while or visiting often over the course of the summer. Those older than age 62 can get a Golden Age Passport, good at all national parks. And anyone, regardless of age, can get a Golden Eagle pass for a fee, good at all national parks for one year. Lower Cape beaches, as a rule, are relatively undeveloped; most have no real restroom facilities but usually have portable toilets. National Seashore beaches, however, do have restrooms and shower facilities. Most Lower Cape beaches do not have concession stands; we've noted the exceptions. Brewster has eight public beaches on Cape Cod Bay, plus a couple of beaches on freshwater ponds, the largest being Long Pond, which lies half in Brewster and half in Harwich. Parking permits for town beaches are available in the lower level of Town Hall on Mass. Rt. 6A, at the rear entrance, (508) 896-4511, from 9 AM to 3 PM daily. The cost is $5 for residents, and for nonresidents it's $8 a day, $25 a week, $45 for two weeks or $75 for the season - very reasonable rates that have remained constant for several years now. Facilities are limited at Brewster beaches. There are no snack bars, though the ice cream truck cruises the beach parking lots on summer days. Portable toilets are the best you'll do for bathrooms. The only lifeguarded beach is at Long Pond, where the town holds its swimming instruction program. Going from west to east, Paine's Creek is the first town beach on the bay. As its name implies, it is fed by a creek and is perfect for children. Parking, however, is limited. Off Lower Road, Robbins Hill Beach and Saint's Landing Beach are both pretty and quiet, and, like all Brewster beaches, are incredible at low tide when the flats seem to go on forever. Breakwater Beach is a popular spot for families. At the end of charming Breakwater Road off Mass. Rt. 6A by the Unitarian Church, the beach is bordered by grassy dunes, and there is plenty of parking. Point of Rocks Landing is nice and quiet, but has virtually no parking. Ellis Landing and Crosby Landing are both great beaches; Crosby is larger and has more parking and is walkable from Nickerson State Park across Mass. Rt. 6A. Within Nickerson State Park, you'll find Flax Pond and Cliff Pond, both great for swimming and picnicking. Harwich has 16 beautiful beaches on Nantucket Sound, plus four on freshwater ponds. Stickers are required for parking, and are available at Town Hall on Mass. Rt. 39, (508) 432-7638. Residents get stickers for $5 a season. The cost for nonresidents, who must show proof of renting in Harwich, is $25 for a week, $40 for two weeks and $50 a season for temporary residents. The exception is Red River Beach, off Depot Road in South Harwich, where you can park daily for $5 on weekdays, $10 weekends and holidays. The town's larger beaches--Red River, Bank Street, and Pleasant Road--have lifeguards and restrooms; a few of the smaller ones like Earle Road and Cahoon's Landing are equipped with portable toilets. Other small beaches on Nantucket Sound in Harwich are Jenkins Beach, right next to Saquatucket Harbor, and Merkle Beach, tucked next to Wychmere Harbor. Harwich also has five freshwater beaches: Bucks Pond, off Mass. Rt. 39; Sand Pond, off Great Western Road; Hinckleys Pond, and Seymour Pond, both off Mass. Rt. 124; and Long Pond, off Long Pond Drive. Town beach stickers, available at Town Hall, are required to park at Long Pond and at Sand Pond; most of these ponds have no lifeguards or restroom facilities. Sand Pond, the site of the town's recreation program's swimming lessons, does have restrooms. Parking permits are required at most of Chatham's nine beaches; the exceptions are Forest Beach Road and Pleasant Street beaches, both in South Chatham, which have limited but free parking. Stickers good at the other beaches can be obtained at the booths at Hardings, Cockle Cove, and Ridgevale beaches, where daily parking is $8. A one-week sticker is $35, and a season sticker is $60. Residents and property owners can get season stickers for $20 at the permit department on George Ryder Road, (508) 945-5180. Only four beaches have lifeguards: Hardings, Cockle Cove, Ridgevale, and Oyster Pond. Those beaches also have restrooms; other town beaches have portable toilets. Cockle Cove Beach, off Cockle Cove Road, is the best choice for families with little ones, since it has life guards. It also has restrooms, and parents will appreciate the calm waves and long stretches of soft sand. Hardings Beach, off Hardings Beach Road, has a concession stand for snacks, restrooms, and quietly pounding surf. Ridgevale Beach, between Hardings and Cockle Cove (at the end of Ridgevale Road) also has lifeguards, restrooms, and a concession stand in summer. Also on Nantucket Sound are Pleasant Street Beach (where you don't need a sticker to park) and Forest Beach Road Beach. Those seeking solitude should head over to Atlantic Ocean-fronted North Beach. Located at the southern end of Orleans' Nauset Beach, it's accessible only by boat. Area water taxis will take you there (and bring you back) for a small round-trip fee per adult. The remote South Beach, off Morris Island Road just beyond the Chatham Light, and also on the Atlantic, provides solitude without requiring a boat. It has no parking lot, so you'll have to walk or bike there. The most desolate stretches take quite a hike, but the quiet and grandeur cannot be beat. Oyster Pond, an inland saltwater pond off Stage Harbor Road that's connected to Nantucket Sound via Stage Harbor and Oyster Creek, is calm and relatively warm and has a lifeguard in season; it also has restrooms. Schoolhouse Pond, situated on Schoolhouse Road in West Chatham, is also worth a visit for its tranquility, but note that parking is limited to Chatham residents. Orleans has only a few public beaches, but when one of them is beautiful Nauset Beach, famous for its wide expanse, big Atlantic Ocean surf, and lovely dunes, and the other is Skaket Beach on Cape Cod Bay, one of the best places to watch a sunset, who could ask for more? Residents get beach stickers for free; renters (who must show proof of renting in Orleans, such as a lease or rent receipt) can get stickers for $35 a week, $60 for two weeks or $85 for the season. People who are renting in nearby towns can get a one-week sticker for $40 or a season sticker for $125. All nonresident stickers are issued at Nauset Beach, (508) 240-3780, where daily parking is available for $10. The same price applies to Skaket Beach, and the one-day permit entitles you to go to either beach--or both--during that day. Nauset Beach, at the end of Beach Road in East Orleans (just follow Main Street east), has lifeguards, a snack bar, and restrooms. You can rent beach chairs and umbrellas, too. Four-wheel-drive vehicles are permitted on one section of the beach, except when plovers and other birds are nesting, but you must have a permit from the Orleans Parks and Beaches Department, 18 Bay Ridge Lane, (508) 240-3775; the cost for nonresidents is $140 for a year; $70 in the off-season (after mid-October). Over on the bay side, Skaket Beach, (508) 255-0572, off Skaket Beach Road, is just as popular as Nauset and also has restrooms. Parking is limited, and the lot fills up fast. At low tide, people flock here for the chance to walk a mile or so through the beach grass and onto the flats. At high tide, it's great for frolicking in the calm water. If you don't want to swim but just want to get your feet wet, stop at the little beach at Rock Harbor, another great place for sunsets. One secret gem is the tiny beach that is reachable by walking down the trail at Paw Wah Point Conservation Area, off Namequoit Road. You'll even find a few picnic tables scattered here and there. Orleans has a freshwater pond worth visiting: Pilgrim Lake, off Kescayogansett Road, features a lifeguard in season as well as changing rooms, picnic areas, a small beach, and even a dock should you decide to moor your boat while taking a dip. Parking at Eastham town beaches requires a sticker, available at the Natural Resources building on Old Orchard Road, (508) 240-5972. Stickers are free for residents; for nonresident renters the cost is $20 for one week, $30 for two weeks and $50 for the season. Visitor can park for $5 a day. But note that although Eastham resident stickers are good for both town and National Seashore beaches, visitor stickers purchased from the town are good only at town beaches and not Seashore beaches. While the National Seashore beaches have lifeguards in season, Eastham town beaches do not, with the exception of Great Pond Beach, on Great Pond Road, and Wiley Park, on the other side of Great Pond off Herringbrook Road. Wiley Park also has a small playground and restrooms, and is great for families. Eastham beaches have no concession stands, but the ice cream truck visits each one periodically all day long. Town beaches that dot the bay side include First Encounter, which is beautiful but can get crowded. To get away from it all, drive beyond the main parking lot and find a spot down by the river, where the beach is lovely and the water is calm. First Encounter is one of the few beaches in Eastham with real restrooms, the other two being Wiley Park and Cook's Brook; the others have portable toilets. Moving up the bay coast, you'll find Thumpertown Beach, which is nice but has limited parking and a stairway down to the beach. Just north of Thumpertown is Campground Beach, which has a larger parking lot and easier access to the beach but can get cramped at high tide. Cook's Brook is quiet and pretty, as is Sunken Meadow; both have limited parking and are frequented largely by the occupants of nearby cottages. On the ocean side are two popular Cape Cod National Seashore beaches--they're easy to find, just turn east at the Visitors Center off Mass. Rt. 6 and keep driving. Coast Guard Beach has virtually no parking at the beach, but there is a large lot just a half-mile away that is serviced by a frequent shuttle bus. Or, park at the Doane Rock picnic area and hike through the woods and over the boardwalk--a pretty walk, but long if you're carrying much gear or have young children. Just to the north is Nauset Light Beach, whose namesake lighthouse was moved back from an eroding cliff in 1996. The lot here fills up fast. If you're really desperate, you can park at the high school on Cable Road, but it's a hearty walk from there. You may want to note that Nauset Light Beach features a towering stairway that leads down to the beach, so if your party includes someone who has difficulty with stairs, choose Coast Guard Beach instead, as it has a gentle ramp leading down to the sands. 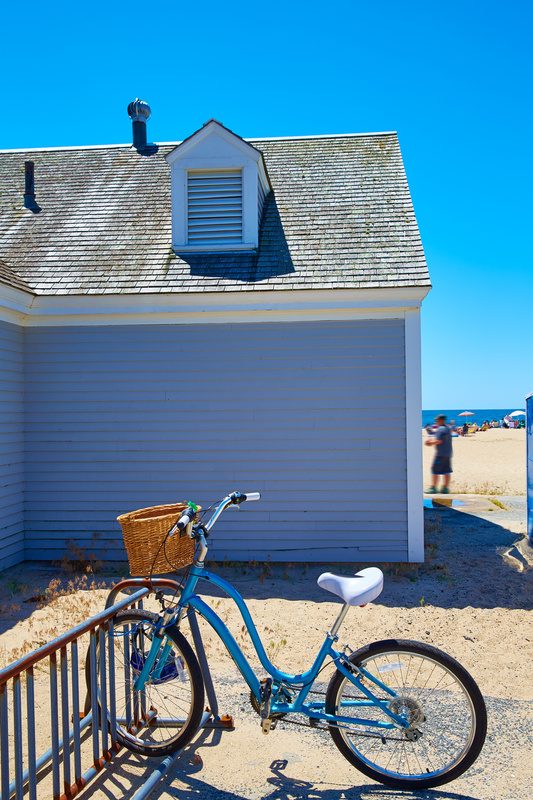 Many of the beaches in Wellfleet require a town sticker; renters can buy one at a specially marked booth on the town pier in July and August, for a $30 a week, $55 for 2 weeks, and $100 for the season. These include the bayside Duck Harbor, at the very end of Chequessett Neck Road; Indian Neck Beach, off Pilgrim Spring Road; nearby Burton Baker Beach; Powers Landing, off Chequessett Neck Road; and, on the Atlantic side, Newcomb Hollow Beach, and Lecount's Hollow Beach (also called Maguire Landing). With the exception of Duck Harbor, all the bayside beaches are really on the harbor, with views of Great Island, which juts into the bay. Great Island is National Seashore territory and more for hiking than beaching, but if you really want to get away from it all, put on your backpack and hiking shoes and trek out to Great Island's remote shores. Indian Neck Beach is perhaps the nicest of all, with its soft, sandy stretch looking out over the harbor and the bay beyond. Adjacent Burton Baker Beach is the only town beach that allows windsurfing but only at certain times of the day. Windsurfers should pick up a copy of the regulations at the beach sticker booth at Wellfleet Harbor. Beach stickers are also needed to park at Great Pond (off Cahoon Hollow Road), Gull Pond (off Gull Pond Road), and Long Pond (off Long Pond Road). Just past the harbor on Kendrick Avenue is Mayo Beach, perfect for families with children. Here you can see boats heading in and out of the harbor, and you can actually park for free here if you can get a space. Right across the street is a terrific playground, so if the kids get restless and bored with the beach (and they sometimes do) you can take them over to Baker's Field for some swinging, climbing, and sliding. You'll also find full restrooms at Baker's Field, an easy stroll across the street from Mayo Beach. Other town beaches have portable toilets. There are no food concessions. On the Atlantic side, Cahoon Hollow Beach attracts a big college crowd, who later in the day flock to the beach-side Beachcomber bar and restaurant. The lot fills up quickly, and you can opt to use a beach sticker or pay a daily parking fee of $10. The same goes for White Crest Beach, just to the south. The waters at White Crest Beach (also called Four Mile Beach and Surfer's Beach) are rougher, making it ideal for the surfers who flock here. Please note that White Crest is not the place to bring young children, senior citizens, or the disabled, as a steep dune path with no staircase leads down to the beach. The National Seashore's Marconi Beach will take your breath away with its beauty. Parents will appreciate the easy access from the parking lot to the beach itself. In season, facilities here include full restrooms and outdoor showers. You'll need a sticker, available to renters in the Beach Commission office behind the Truro Center Post Office, to gain access to just about all of the beaches in Truro. The cost is $10 a year for residents; for nonresidents, it's $20 a week, or $100 for the season. All the town beaches are equipped with portable toilets. If you want the real facilities, go to the National Seashore's portion of Head of the Meadow Beach on the ocean side--Head of the Meadow Beach is owned half by the town and half by the Seashore. Both sides have lifeguards in season, so this is a good choice for families with children. Another plus is that the ice cream truck cruises this lot. If you don't have a beach sticker, you can park at the town portion of Head of the Meadow for fee. The same goes for Corn Hill Beach, on the bayside; all other Truro beaches require stickers to park. Also on the ocean side, Ballston Beach and Long Nook Beach are very popular, so you must get there early to get a parking space. Long Nook is quiet and banked by dune cliffs; Ballston requires some walking to get out to the beach, so, if you have lots of gear, carrying it can be awkward. Another Truro beach on the ocean side is Coast Guard Beach (not to be confused with the National Seashore beach by the same name in Eastham). On the bay side, Corn Hill (also on the ice cream truck's route) has plenty of parking and is popular with families. This picturesque beach is right at the mouth of the Pamet River, and you'll see boats heading in and out of the harbor. At the southern end of town, also on the bay side, is Ryder Beach, which has been something of a well-kept secret. It's a lovely beach but not heavily frequented, so it's a nice choice for those who want to get away from crowds. Just north of that is Fisher Beach, which is nice but has only a tiny parking lot. North of Corn Hill is Great Hollow Beach, which is lovely and quiet, and then Cold Storage Beach, also called Pond Village, which is very popular, so get there early in the day. On Mass. Rt. 6A near the Provincetown line is Beach Point Landing, often called Topmast because parking is right next to the Topmast Motel. Provincetown is unique in that it has no real town beaches--and thus, there is no such thing as a Provincetown beach sticker. The two main beaches here are both part of the National Seashore: Herring Cove and Race Point. The waters are warmer and calmer at Herring Cove, but sun worshipers often prefer Race Point since it faces north and gets sun all day long. Still, everyone agrees that the sunsets at Herring Cove are unparalleled on the entire Cape, since the sun actually seems to set into the ocean, unusual for the east coast. National Seashore beaches have lifeguards, full restrooms and outdoor showers. The Harbor Beach, running parallel to Commercial Street alongside the bay, is ideal for those more interested in a walk at water's edge than a swim. There's no beach lot per se, but the closest parking is the town lot at MacMillan Wharf, which has hourly rates. There are also various town landings along the length of Commercial Street that give beach access. If you really want to get away from it all, head for the very tip of Cape Cod: Long Point, where Long Point Lighthouse signals the entrance to Provincetown's busy harbor. You can get there by two routes, one by land, the other by sea. Walk across the breakwater at the western end of Commercial Street adjacent to the Provincetown Inn. It's a delightful walk, about two hours--but it seems like a longer walk back. Or, hop aboard a water shuttle from Flyer's Boat Yard at 131 A Commercial Street, (508) 487-0898. The shuttle leaves every hour or so, with the last return around 5 PM, and costs $7 one way, $10 round trip. Hatches Harbor, off Herring Cove, is a natural harbor reachable only two ways: either by a long walk along Herring Cove Beach or by a short drive with a four-wheel-drive vehicle over the sand. Its remoteness makes Hatches a perfect spot for those seeking solitude. On any given day, there's usually just a handful of visitors, most of them townies picnicking or fishing from their four-wheel-drive vehicles. The area surrounding Hatches Harbor was once home to early fishing settlements. Race Point Lighthouse is nearby, adjacent to the newly renovated light-keepers house, which is now reserved as a retreat for ecologists, scientists, and artists. Start your search today for Cape Cod Beach Homes or Cape Cod Waterfront Homes.